Building a sandbag levee or wall is achieved by laying the bags like brick work. Start at one end and work to the other end. Ensure that the unfilled part of the bag is covered by the next bag. Tuck flap under the bag at the end of the row. And stagger rows so that the joins do not line up. Flattening the top of the sandbag row before adding the next row will help the integrity of the structure. You want to build the wall a few feet out at a minimum. Don't build too close to the river or other flood source because the levee will encroach on the flood plain. Dig a narrow trench so that a lock is created in the ground. This is called keying the ground. It is important because when the sandbags are laid it will form a seal to the ground. 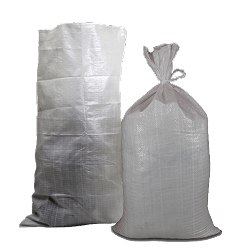 The sand bag can't be pushed away by flood water and water can't easily flow underneath the bags. Before the sand bags are laid in the trench 10 foot wide polyethylene sheeting should be laid over the trench before and sandbags are laid in place. Allow for at least 3 feet of poly measured from the edge of the trench to be overage. The next step is to lay the sandbags in to the trench (overtop of the polyethylene sheeting) to perform a hard tight seal in the trench. Tamp each bag with feet stomping. Buy the longest piece of polyethylene possible and if there is a seam have a large overlap of at least a few feet. For each foot of height that the levee wall will measure you will need a 2 foot base for stability. When the levee is completed simply fold the polyethylene plastic sheeting over the sand bag levee and anchor with additional sandbags on the other side (Dry or protected side) of the levee/wall. Single row stacking works well in flood areas where there is no streamflow velocity or danger from floating logs and tree stumps, or from wave action with the potential to topple bags. Although generally not recommended to stack above three courses (layers) in height (of approximately one foot), if a barricade to protect structures from impending water damage (as shown in the photo) is needed higher single-stack placement can be effective. Use pyramid placement to increase the height of sandbag protection. Use caution when raising levee height. It is critical to determine the height of the sandbag raise by accessing the latest reliable forecast of flood conditions. Example: When water level is currently one foot below the top of the levee and is predicted to rise three more feet, construct a 2-1/2 foot sandbag operation which includes one-half foot of height as a safety factor. It's important to compact each bag in place by walking on it, butting the ends of the sacks together, maintaining a staggered joint placement and folding under all loose ends. Watch for flooding elsewhere, and watch for boils on the landward side of the levee due to the increased water elevation. The term "sand boil" comes from its look - like water boiling up from the ground. In order to create a sand boil, water has to be higher on one side of the levee than the other, creating higher pressure on one side of the levee. Water begins to move through the soil under the levee, from the side with high water to the side with low or no water. The process of water seepage is not a problem unless water moving under the levee begins to carry soil particles along with it. The foundation of the levee is the soil on which it sits. When water moving under the levee begins to remove soil particles, the soil "structure" of the levee begins to deteriorate. If enough soil particles are moved from under the levee, the levee will collapse. It's generally not necessary to build a ring dike around a boil that is not transporting soil - but it is important to monitor the boil for any change in condition. Don't attempt to place sandbags directly on the boil. Pressure applied to plug the boil will cause water seeping through the levee to find other channels and could cause levee failure. A two to three foot radius from the center of the boil to the inside edge of the ring dike is a minimum radius—contain the entire area experiencing boils within the ring dike. Build a spillway section in the dike so water runs out in a controlled manner. This diverts the overflow water away from the dike and reduces erosion on the levee slope. Once the spillway water runs clear, and is not transporting soils the ring dike is complete.